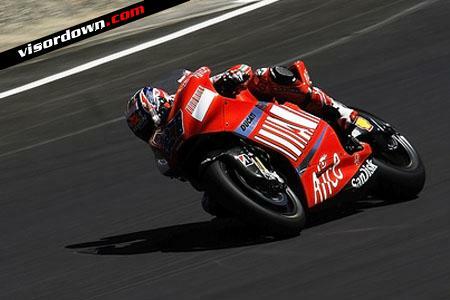 CHAMPIONSHIP LEADER Casey Stoner put one hand on the 2007 MotoGP crown with an emphatic win at Brno circuit earlier today. The Australian took his seventh win of the season in dominating style, leading from the green light to the chequered flag, crossing the line almost eight seconds ahead of Suzuki's John Hopkins. Stoner's win gives the 21-year-old a clear 60 point lead over nearest rival Valentino Rossi, who could only manage a disappointing seventh. Current World Champion Nicky Hayden took the final spot on the podium, knocking his team mate Dani Pedrosa into fouth.